Hummingbirds are garden jewels, as beautiful as they are valuable. Each weighing less than a nickel, hummingbirds play an important role in the garden as pollinators and insect predators. 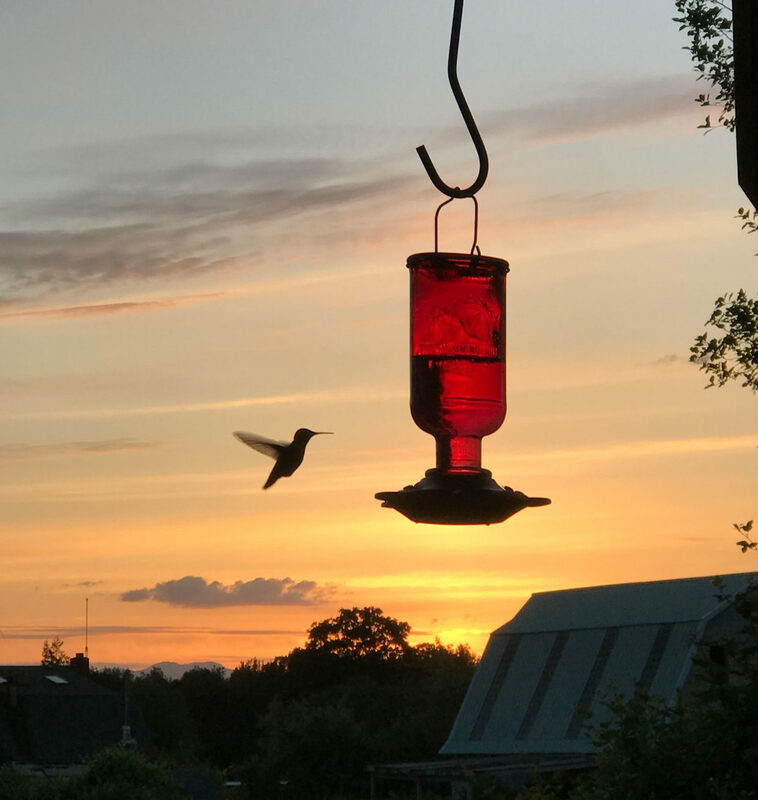 Five kinds of hummingbirds regularly visit Oregon, according to Nancy Allen, faculty member in fisheries and wildlife at Oregon State University. Rufous hummingbirds, the most common, migrate south for the winter, returning north to most regions of the state in March and April. Anna’s hummingbirds are year-round residents in western Oregon. And there are small populations of black-chinned, Allen’s and calliope hummingbirds in southern and eastern Oregon during summer. There are two ways to attract hummingbirds to your garden – by growing nectar-producing flowers and by supplementing natural nectar with sugar-solution feeders. Hummingbirds need to eat a third to a half of their body weight daily to fuel their high-energy lifestyle, Allen said. Their diet includes nectar for carbohydrates and insects for protein. Protein in their diets is especially important while they are feeding youngsters. Chances are your garden already contains elements favored by hummingbirds, since they use a variety of trees, shrubs, and vines as shelter and sources of food. Hummingbirds are especially attracted to the color red. Good choices are plants with red or orange tubular flowers, such as fuchsias, red-flowering currant, columbines, coral bells, salvias and penstemons. They also love bush and vine honeysuckles, hollyhocks, nasturtiums and petunias as well as blossoms from black locust, flowering crab apple and hawthorn. Provide a succession of nectar plants that will bloom from spring to fall, giving hummingbirds a continual source of food through the seasons. Their attraction to red can get hummingbirds into trouble with electric fences, Allen said. If you have electric fences with red or orange insulators, Allen recommends that you paint them black or white so they won’t lure hummingbirds to a possibly fatal shock. Another caution is with hummingbird feeders. It is important that feeders are clean, and the sugar solution is correctly made and always fresh. A hummingbird feeder solution should contain no more than one part sugar to four parts water, the highest sugar concentration of most natural flower nectars, and should not contain food color. Homemade solutions are more economical and sometimes safer than store-bought products. Allen offers a recipe for a safe sugar solution for hummingbirds: Mix four cups water with one cup of sugar. Microwave or boil the mixture for at least 30 seconds to retard fermentation and mold growth. Let the solution cool, then fill your feeder. Store the spare solution in a clean jar in the refrigerator for up to three weeks. The feeder should be hung where it can be easily reached for filling and cleaning. Space multiple feeders as far apart as possible, as the birds tend to fight over feeders hung close together. Shady spots are best – they keep the sugar solution from spoiling. Change the syrup once every couple of weeks in cooler weather and every four to five days during the summer heat if needed. Clean the feeder with hot water and a little vinegar and rinse well every time you change the syrup. And be sure you have someone keep your feeder filled when you go on vacation, as the little birds come to depend on known sources of nectar. Keep feeders filled year-round for our local populations.